I've read one of the papers published in this collection, Alexander Golitzin's “`Earthly Angels and Heavenly Men': The Old Testament Pseudepigrapha, Niketas Stethatos, and the Tradition of `Interiorized Apocalyptic' in Eastern Christian Ascetical and Mystical Literature”. Golitzin is an Orthodox bishop and scholar based in Texas, specializing in the connections between Christian mysticism and Second Temple Jewish ditto. His article on Niketas is extremely scholarly, and could therefore be a hard read to those not already informed about the subject. 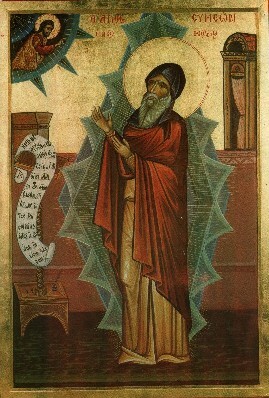 Niketas Stethatos was an 11th century Byzantine mystic. He was a follower of Symeon the New Theologian, who in his turn was a disciple of Symeon the Studite. All three were extremely controversial and could be regarded as forerunners of the 14th century hesychasts. Golitzin tries to place Niketas and his teachers in a broader context of Christian monastic mysticism, in turn part of a general mystical tradition with deep roots in the “intertestamental” period and perhaps earlier. Christian monks read, copied and preserved Jewish pseudepigrapha, most notably the Enochian corpus, despite official skepticism or hostility towards this kind of “non-canonical” scriptures. Similarities with evolving Jewish mysticism suggest either a parallel development due to common origins, or Jewish influence on Christian mysticism. As for being non-canonical, the mostly Slavic “Byzantine commonwealth” hardly even had a canon until very late, making it possible for pseudepigrapha to survive there despite occasional bouts of doctrinaire orthodoxy in the Empire itself. A difference between Niketas and his teachers, on the one hand, and earlier mystics on the other, is that the former have a strong tendency to “interiorize” the mystical ascent to God. It's not an actual out-of-body experience, literal meeting with Christ or bodily transmogrification. Rather, it's a purely spiritual process that takes place in the soul (or the Heart) of the believer. The role of the angel in the mystical ascent texts is taken over by the earthly teacher or elder. However, the difference between the various schools cannot have been absolute. Niketas reports that his master Symeon the New Theologian was once literally bodily transfigured! Of course, not everyone accepted the interiorization, and the more dramatic idea that the mystical ascent and visions of God in “human” form were to be taken literally, persisted throughout Byzantine history.